The identity of the sitter in this portrait was until recently unknown, however research undertaken by Philip Mould & Co. has identified the subject as Ralph Symons, an important early English architect best known for the construction and redesign of a number of colleges in Cambridge. We know tantalisingly little about Symons prior to his arrival in Cambridge in 1584, and the only reference to his early life is found in a document dated 1587, in which he describes himself as ‘of Barkhamstedd in the Countie of Hartford Freemason’. Although it is possible that this refers to his place of origin, it is equally likely that it might allude to his previous place of employment. In another contemporary document, he is apparently described as a ‘stone mason of Westminster’. As a skilled mason, Symons would have travelled widely in search of employment, and it is quite possible that he was drawn to Berkhamsted - which by 1563 had only around 545 inhabitants - to work on Berkhamsted Place, an impressive country residence built by Sir Edward Carey using stone recovered from the derelict Berkhamsted Castle. Berkhamsted Place is thought to have been completed around 1580. It could well have been Carey who then introduced Symons to Walter Mildmay, husband of Carey’s half-sister Mary Mildmay (née Walsingham), and founder of Emmanuel College, Cambridge. Symons’s brief at Emmanuel was to adapt and rehabilitate the remains of the thirteenth-century Dominican priory into the College’s buttery, hall and fellows’ parlour. Symons also built the founder’s range, the small range, the hall range, the chapel range (east side of the entrance court), and adapted the original western range of the inner court (the old building). His design was praised not only for converting the medieval priory church into the heart of Mildmay's new college, but also for aligning the chapel (now the old library) north and south, rather than east and west. He finished work on Emmanuel College c.1586/7. By the time he had completed works at Emmanuel, Symons had built up a significant reputation, and his newly acquired wealth and position allowed him to act as a speculative builder in his own capacity. In 1586 he rented a property (a plot of land and a house known as the Pensionary, on the corner of Emmanuel Street and St Andrew’s Street, just opposite the College) for 60 years from the Master of Clare College at an annual rent of 10 shillings. On it, next to the house, Symons built six tenements worth £12 a year and sub-let some of them. Two years later, Mildmay bought the remainder of Symons’s building lease for £120. s.
Symons was next employed for a re-planning project at Trinity College, where he built the Great Court in 1593 and the hall and the kitchen in 1604. He might also have designed Nevile’s Court too in 1612 but this cannot be proved. Between 1596 and 1598 Symons was employed by the newly-founded Sidney Sussex College, and between 1598 and 1602 by St John's College, where he worked on the Second Court in collaboration with Gilbert Wigge, when he lost one of his hands. The architectural drawings relating to the St John’s commission are in the collection of the college library and are the oldest surviving examples of such drawings relating to any Cambridge college. Symons also submitted a design for buildings at King's College in 1602-3. The distinction between an architect and a stonemason was imprecise in late-sixteenth century England. A mason would have typically worked under the supervision of a master, whereas an architect would have been more involved in the design process and thus more distanced from actual construction. The survival of the drawings for the Second Court at St John’s, however, suggest that Symons was increasingly involved with aspects of design by 1598, although the loss of his hand might suggest he was not one to back away from physical labour. The pursuit of mathematical precision in construction had, by the late sixteenth century, become a specialist area with a number of books and treatises published on the subject. The tools used for these calculations also underwent reappraisal, and were redesigned to achieve greater practicability and precision, elevating them into symbols of sophistication and professional distinction. It is perhaps not surprising, therefore, that Symons is shown here wielding an elaborate compass decorated with highly detailed engraving. This instrument, also known as a military compass, takes the form of a dagger when closed. Daggers and swords being accessories of the male social elite, its inclusion in the present work can be read as a dichotomous conceit, referring both to Symons's practical profession and his increasing social status. This attempt to visually enhance his status is reflected again in his choice of dress, which can be broadly interpreted as a modest version of the fashionable style of his day. The style of plain linen ruff, which would have required a considerable amount of maintenance, was popular from the 1570s onwards, and the patterned black doublet over a white linen shirt with blackwork embroidery, was popular from the 1580s onwards. As a professional working man, Symons would not have been overly concerned with keeping up to date with the latest fashions, and an outfit such as this could easily have been acquired at an earlier point – perhaps on his arrival in Cambridge in the mid-1580s - and reused when the opportunity presented itself. Both these fashionable features, however, are countered by the extraordinarily novel inclusion of a craftsperson’s leather jerkin, an unambiguous reference to Symons’s practical profession - although the fine metal-thread embroidery around its edges suggests this was a more sophisticated adaptation of the traditional form. 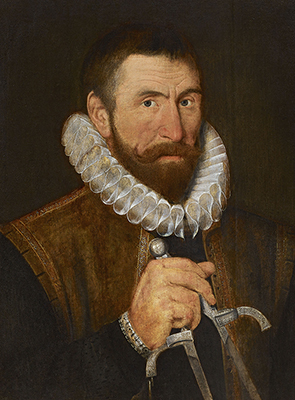 It is difficult to say for certain when Symons sat for this portrait, although given the probable provenance (discussed below), it seems likely that it was sometime during or after his work at Sidney Sussex College between 1596-98. The early provenance of this portrait is unknown, although it is possible that it was commissioned or acquired by a college associated with Symons and later deaccessioned. The representation and commemoration of historic contributors was championed by the Oxford and Cambridge colleges, many of which acquired portraits of illustrious figures (mainly benefactors) during the second half of the sixteenth century. Although Symons would certainly not have been considered as important as a college benefactor, his input in creating the new and improved visual identity of colleges might well have warranted his inclusion amongst other likenesses in the college collection. Indeed there exists at Emmanuel College a slightly crude later copy of the present work, which is currently on display in the college gallery. It seems likely that the present work is the lost likeness of Symons once recorded in the collection of Sidney Sussex College - a logical inference given that Symons worked there between 1596 and 1598, and would furthermore explain how the artist of the Emmanuel copy gained access to it. The evidence surrounding the missing Sidney Sussex portrait has been the subject of much debate over the years. It is known that a portrait of Symons was recorded in a series of Master’s inventories from 1639 to 1748 and that it then disappeared. A portrait, supposedly depicting Symons, then reappeared in 1813, however according to scholar J.W. Goodison, this identification had been applied incorrectly to another unrelated portrait, and the Symons portrait remained unlocated. Although we cannot be sure that this portrait was the same as that discussed above, there can be little doubt that it was the same portrait of Simons copied in crayons by Thomas Kerrich (1748-1828) [Society of Antiquaries, London] and later published in print form by the Facius brothers in 1803 [Stanford University Libraries]. The similarities between the Kerrich drawing and the present work are highly distinctive - the detailing on the jerkin, for example, is identical, as is the depiction of the contours on Symons’s face, as well as the strong shading in the hand. The broad sweeping strokes visible beneath the folds of the ruff are also replicated in the Kerrich drawing, suggesting that the condition in this area has remained largely unchanged since the late eighteenth century. When the print was published in 1803 it was inscribed ‘From an original Picture which was in the/ possession of the late Mr. Essex at Cambridge’ and we can presume that ‘Mr. Essex’ refers to James Essex (1722-84), the celebrated Cambridge architect and close friend of Kerrich. There are many reasons why Essex would have wanted to own a portrait of Symons, and the fact that Symons was his predecessor at Emmanuel and at Sidney Sussex is perhaps the most significant. In the draft of Observations on the Old Chapel of Sidney Sussex College in Cambridge, Essex praises ‘Rudolph Symonds, who ingeniously contrived to convert the Chapel of the Dominic Friars, into a Refectory, and the Refectory of the Franciscans into a Chapel’. Undoubtedly, Symons’s work had inspired, or partly inspired, Essex’s interest in the Gothic style and it is possible that Essex considered Symons one of the last true practitioners. In the unpublished Observations on the Antiquity of Masons and Masonry in England (1770), Essex claims that the Gothic style of the fifteenth-century freemasons reached a ‘surprising degree of perfection’ which surpassed that of Rome and Greece. Essex explains that the principles of this perfection were kept secret by ‘societies of masons’, who only shared it with those who were capable of the perfect knowledge called ‘mystery of masonry’. This impenetrable secrecy of knowledge mainly consisted in the ideas of Vitruvius, and the several arts and sciences with which an architect should be acquainted, such as astronomy, mathematics and geometry. This particular point resonates strongly with the portrait of Symons, who is shown holding a pair of elaborate dividers, which are themselves symbolic of accuracy and perfection. We also know that Essex was interested in masonic symbolism and ritualism, and his unpublished Observations and related material contains a version of two early masonic exposures (The Grand-mystery of the Free-masons Discovered, 1724, and the Whole Institutions of the Free-Masons opened, 1725). It is possible, therefore, that Essex considered this portrait both an important likeness of a figure he greatly admired, but also a representation which fitted with his ideas on freemasonic symbolism as he knew it. The obvious symbolic attributes of the portrait perhaps also explain its recent re-emergence in Italy. At the time of Italy’s unification in the second half of the nineteenth century, a pair of compasses was an unmistakable symbol associated with secret societies, nationalism and liberation, and the interlaced square and compass, a recognised and accepted international masonic emblem from at least the beginning of the eighteenth century, was in Italy the symbol of the fight against all tyrannies and invaders. Both Rome and Turin have been capitals of the newly reunited Bel Paese at different stages and were much infused with a spirit of freedom and independence. The collection at Villa l’Abate, where the painting has hung in recent years, shows a particular preoccupation with the architecture of Turin and the importance of Turin for Italian civilisation. Perhaps, in the collector’s view, Symons’s compasses could be perceived both as a symbol of architecture and of independence. R. Willis and J.W Clark, The Architectural History of the University of Cambridge, and of the Colleges of Cambridge and Eton (Cambridge, 1886), vol. II, p. 693n. S. Bendall., C. Brooke, P. Collinson, A History of Emmanuel College Cambridge (The Boydell Press, 1999), pp. 97-102 Symonds’ cottages survived until 1955 when the Council decided to knock them down (apparently to make space for a bus stop). In the Emmanuel College Archive Picture Room there are two photographs, and also a painting by Trevor Haddon, which are evidence of old St Andrew’s Street before the demolition. We would like to thank Aileen Ribeiro and Professor Maria Hayward for their thoughts on the dating of the style of dress seen in this portrait. The portrait has a painted inscription which reads: ‘Effigies Rodulphi Symonds, architecti sua ætate peritissimi, qui præter plurima ædificia ab eo præclare facta, duo collegia Emmanuelis hoc Sydnii illud extruxit integre magnam etiam partem Trinitatis reconcinnavit amplissime.’(‘The likeness of Ralph Symonds, the most skilful architect of his time, who besides many other distinguished buildings constructed two colleges, Emmanuel and Sidney, in their entirety, and also carried out extensive improvements to a large part of Trinity’). The most recent and thorough research was undertaken between the 1960s and 1980s by Dr Frank Stubbings, Librarian, Vice-Master and Life Fellow at Emmanuel College, who is the author of, among other publications, a catalogue of portraits and two guides to the College. Stubbings’ research notes can be found in the Emmanuel College Archivist’s Portrait Files relating to this work. Sold by Christies, London, 21 March 1989, lot 90 (one of four items in same lot). Published 1 August 1803 by W. Richardson, York House, No.31, Strand. The print does not state the whereabouts of the portrait at the time of publication, and it is likewise not known when Kerrich made his copy in crayons. Given that Kerrich was Essex’s literary executor, it is possible that the portrait passed into the possession of Kerrich after Essex’s death, and that it was then that the copy was made.